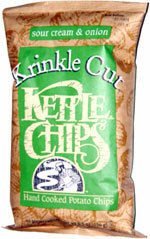 Taste test: These chips were wide-rippled and thick-cut, and they had a pretty good crunch. Some of the chips were impressively wide in one dimension, as if they were cut the long way along a very oblong potato. They tasted good, but I was disappointed, because I was really expecting a lot more. There was some of the great potato taste typical of Kettle Chips, but the rippled format seemed to water down the intensity of the taste. 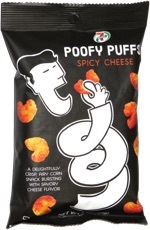 The sour cream and onion flavor was good but very mild, so there was nothing really impressive about it. Smell test: Wow, just an awesome baked potato with sour cream smell. Great!